By the time this column appears, the voters of Montana will have decided the fate of GOP candidate Greg Gianforte in his quest to become a member of the U.S. House of Representatives, but Gianforte's alleged physical assault on a reporter the night before the election should concern all of us, regardless of the outcome. 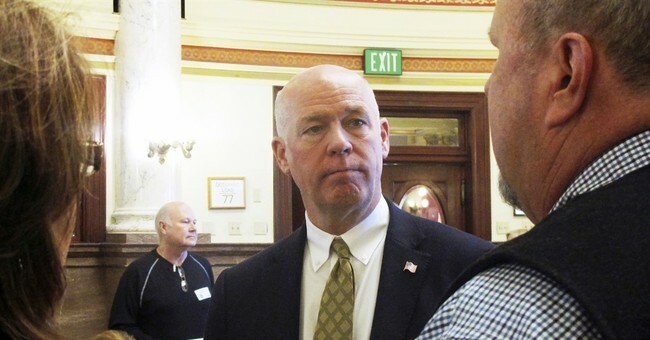 Witnesses and an audio recording depict Gianforte assaulting a reporter who was asking a legitimate question about the candidate's stance on the American Health Care Act, which was recently passed by the House. As reporters do when a politician evades answering, The Guardian's Ben Jacobs asked the question a second time. Jacobs' tone was respectful, not badgering as Gianforte's campaign suggested in its statement about the incident. In response to the question, Gianforte, according to witnesses from Fox News Channel, put his hands around the reporter's neck and threw him to the ground, punching at him. The audio recording refutes the campaign's insistence that the reporter was asked to lower his phone recorder and that he was asked prior to the alleged assault to leave the room. Instead, what we hear is a scuffle and the reporter saying he's been "body-slammed" and his glasses broken and Gianforte screaming, "I'm sick and tired of you guys!" Gianforte then repeatedly told Jacobs to "get the hell out of" there while the reporter, according to the witnesses, was struggling to his knees. What makes this case more than a one-off by a perhaps unhinged candidate is that it has occurred at a time of unrelenting hostility toward the press by the right, exemplified and encouraged by the president. This is unhealthy for democracy and an attack on our civic institutions -- the kind of thing you'd expect in Venezuela or Russia or Turkey, but not in the United States. Referring to legitimate news coverage as "fake news" and the people who report it as the "lying media" and "the enemy of the American people," President Donald Trump is undermining one of the basic foundations of our republic, a free press. This is dangerous and ought to be vigorously opposed by conservatives, as well as everyone else. Americans of all political persuasions find the president's relationship to the media disturbing, according to a recent poll by the Pew Research Center. Some 83 percent of adults said "the relationship between Trump and the media is generally unhealthy," and nearly three-quarters said that the tensions are "getting in the way of Americans' access to important political news." The president is playing with fire. For years, conservatives have felt aggrieved at what they believe is liberal bias on the part of reporters and editors in the mainstream media. I've been on the receiving end of negative news coverage over the years. But I've also found that it is possible to correct the record when a reporter gets it wrong and to fight back with facts and well-articulated arguments. And most of the time, I've felt reporters got it wrong more out of ignorance or sloppiness than political bias. Sure, most of those who work in the mainstream media identify with liberal positions, and the mistakes they make often reflect that bias. But I've met few reporters who are ideologues or who let their biases get in the way of finding or reporting the facts. Cable news talk show hosts and guests are a different breed (as are opinion writers), and their biases drive ratings, but MSNBC and CNN are no more biased than Fox News Channel, and the latter has benefited in ratings for years from biases conservatives crave. In the 1950s, newspapers were perceived to have a conservative bias; indeed, every era seems to have generated suspicion that political preferences have pushed reporting in one direction or another. Politicians, including the president, have frequently complained. Richard Nixon drew up an "enemies list" that included three journalists, but the remaining 17 were politicians, businesspeople, Hollywood figures and even a private investigator. But even Nixon mostly seethed in private, and what actions he took he tried to hide. Trump, on the other hand, whips up his supporters and uses Stalinist rhetoric to describe the news media as enemies of the people. We shouldn't be surprised, then, when a Trump acolyte like Greg Gianforte decides to use force to try to shut up one of these "enemies." House Speaker Paul Ryan has condemned Gianforte's behavior as unacceptable, but on the day of the special election in Montana, Ryan was unwilling to suggest he would call for Gianforte to be refused admission to the House of Representatives. The House has that right, which it has exercised at least 30 times in the past. If Gianforte wins the special election, Ryan should make it 31.